There can't be too many club's whose reserve side was founded before the First XI. However, thanks to a convoluted history of mergers and takeovers that seem to pepper Spanish club football, we have in UD Las Palmas Atlético a historic quirk that Marty McFly may find hard to accept. Thankfully, the explanation is far more straightforward. You see, UD Las Palmas Atlético can trace its roots back to a club founded in 1941, namely Unión Atlética Club de Fútbol. Unión Atlética was not one of the five senior teams that merged in August 1949 to form Unión Deportiva Las Palmas. Instead, they carried on their merry way until they became an affiliated club of UD Las Palmas in 1959. 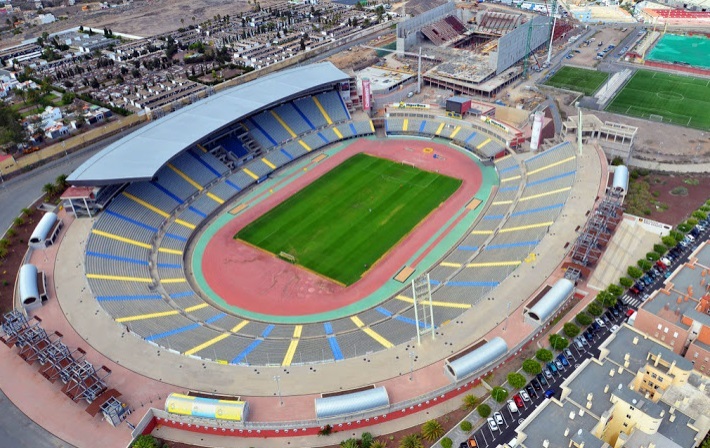 The move led to a name change, and for the next 18 years, the club went under the name Unión Deportiva Las Palmas Aficionado, plying its trade in the island's regional leagues. Following promotion to the Tercera in 1977, the club became the official reserve side of the island's senior team, going by the name of UD Las Palmas Atlético. Success was almost immediate, as the Tercera title was won in 1979 and with it, promotion to Segunda B. There followed three seasons in the third tier, with a highest finish of ninth in 1979-80. On its return to the Tercera, the club ran up a series of top three finishes, and returned to Segunda B for season-long stays in 1987-88 & 1990-91. In 1990 the Spanish Federation modified its regulations, dictating that all clubs in the top two divisions become either limited companies or registered membership associations. This in turn meant that all affiliated teams of a professional club, must be assimilated into the professional club. 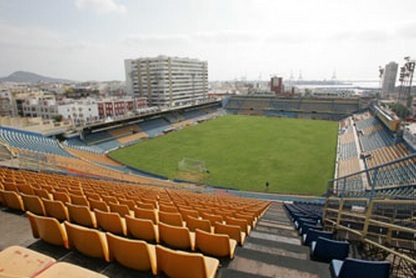 This led to the dissolving of UD Las Palmas Atlético, and in its place rose Unión Deportiva Las Palmas B. It was business as usual in the Tercera as the club continued to rack-up the top three finishes, but promotion to Segunda B proved more elusive after a series of failures in the end of season play-offs. The club finally made a return to Segunda B in 2007, after play-off victories over Jerez CF & CD Ciempozuelos. The return to the third tier saw the club reclaim the name of UD Las Palmas Atlético, but unfortunately not the staying power of their 1980's counterparts. They finished 16th in 2007-08 and entered the relegation play-offs. Here, Sporting Gijón B dealt out a 4-0 hammering, and Atlético returned to the Tercera for the next four seasons. An eighth Tercera title was secured at the end of the 2012-13 regular season, then Asturian’s CD Tuilla were beaten 3-1 on aggregate to earn a return to Segunda B. 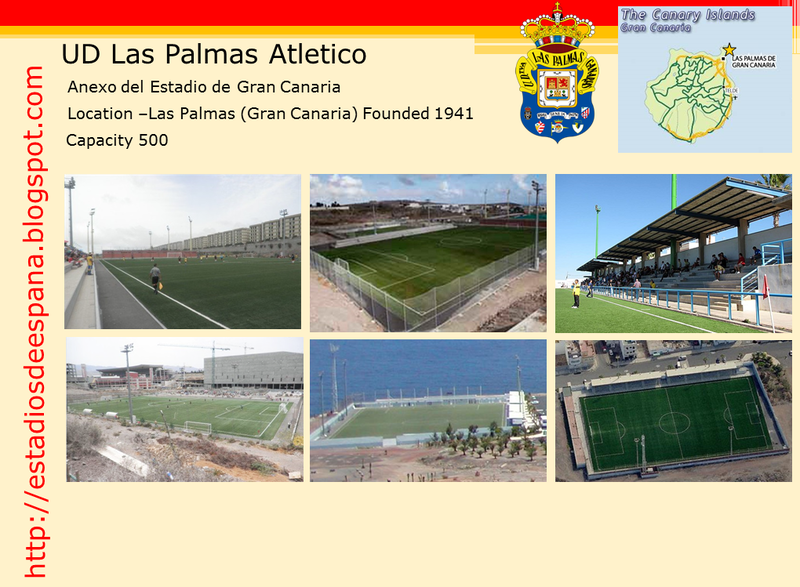 Over the years, UD Las Palmas Atlético has used a number of stadiums in the city. They continued to use Unión Athletic's Estadio Pepe Gonçalvez until 1954, before moving into the Estadio Insular with the first team. Here they remained until the closure of the old stadium in 2003. 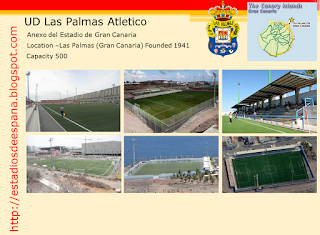 Whilst the first team headed south to the new Estadio Gran Canaria, the reserves moved north to the Estadio Municipal Las Coloradas, situated on the very northern tip of Gran Canaria, around 3 miles out of town. 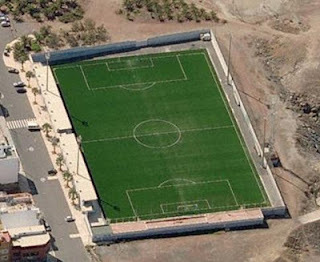 Atlético used the refurbished Campo Pepe Gonçalvez when they last appeared in Segunda B back in 2008, sharing with one of the Island's other teams, the short-lived Universidad de Las Palmas. Following relegation to the Tercera a year later, Atlético returned to Las Coloradas, but in 2010 they moved to the newly built Anexo Estadio de Gran Canaria. As the name suggests, their new home stands next to the soulless municipal stadium and is sandwiched between a training pitch and hockey arena. It features an open terrace of 4 wide steps on the west side of the ground which has a capacity of 500. Floodlights & an artificial surface complete the facility. Whilst Atlético has the option to use the larger stadium, it seems unlikely that they will do so, despite promotion to Segunda B. The small fan base and the absence of any significant travelling support means that the Anexo can cope perfectly well with crowds of a few hundred.